I'm delighted to share with you today another piece of concept artwork, this time showing the Ranger engaging in combat. Very nice. Is that a new bow or a pre-existing bow whos looks have been refined? "YOU CAN'T FIX STUPID! NOT EVEN WITH DUCT TAPE"
Yea this ranger look like an adventurer, an explorer of a lost world. (in contrast with dragonlord who is a war armor) I like the cape but not the hood shape maybe the end of the hood is too long. I dream to wear a black or a green cap on my dl cuirass. I could agree with you, but then we'd both be wrong. Awesome! But the hood put it off for me a little. Fantastic. 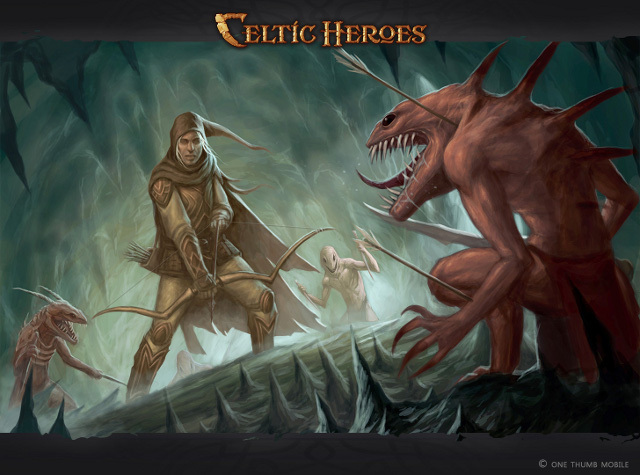 The concept art looks outstanding and very accurate as to the skills of rangers. Hopefully it will translate into the game just as well. The update is much appreciated. One day you'll look back and realize they were the big things. Art doesn't fix in-game problems, getting real tired of this. Feels like you have 2 people running your company, one on the forums, one for the game, and you guessed it none on support. I don't understand why you're so stressed on making new content if the old stuff is broken and needs tending to. Can you please explain why there aren't people working on small but frequent patches for balancing and bug fixes and one group working on big things like this and others running support etc? There is so much mighty crap in banks.. fusion would allow us to put this into use..